Our blog was about the people we met and the stories they told. As a storyteller, I should have done a better job beginning at the beginning with our tale. In April 2006, Jim and I hiked the Grand Canyon, Bryce and Slot Canyons in Escalante. During our trip we ended up in Paige, Arizona. Not only are we early risers, we are East Coasters, which meant at 5 a.m. we were up and ready to go, although not much else is in Paige. Except, of course the Wal-Mart Supercenter. We pulled into the parking lot amid at least a dozen RVs. Not sure what was up, we asked why? We learned Wal-Mart allows RVs to stay in store parking lots over night. For free. As we hiked up Bright Angel Trail from Phantom Ranch in the Grand Canyon a new adventure was born. I started thinking about all the other amazing things there are to see in this vast country of ours. And then I started thinking about how Wal-Mart — one in every town, practically — lets you park overnight for free. The idea just sort of came together. We would take vacation from our full-time jobs and drive across the country in a rented RV, from city to city, spending the night in a different Wal-Mart parking lot every night. And, of course, I’d write an article about it and may be able to sell a story to an RV magazine, with photos, of RVing in America and only staying at Wal-Marts. Given the litigious age we live in, we decided to get permission from Wal-Mart to do so. So I called my brother, who works at Edelman and whose clients include Working Families for Wal-Mart, in order to find out if we’d be allowed to talk to people and take pictures in Wal-Mart parking lots. As a freelance writer, I’ve learned over the years that it’s always better to ask about stuff like that in advance. They didn’t just give us permission. They said they would even sponsor the trip! A blog seemed the perfect medium to tell those stories — a perfect way to present a diary of my trip. I would post about the trip, not after the fact but from right out there on the road. And even more exciting, no editors! What writer could say no to that? All in all, it was a perfect fit. 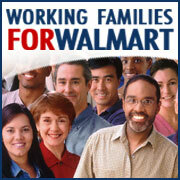 Working Families for Wal-Mart wants to get the word out about all the good things Wal-Mart does for people. I wanted to make this trip and write about it. It just seemed to work. Not everybody saw it that way, though. While we were on the road, a blogger asked if we were real people. We are. We’re real people, and we took a real RV on a real trip and wrote real stories about it. And the people we met, many of whom I wrote about on the blog, are all real people too. Not paid spokesmen. Just real people, all of whom gave us permission to tell their stories. Of course, now everybody knows just how real we are. Thanks to an organized Wal-Mart opposition group, the whole world now knows who Jim and I are, where we live, what our home life is like and where we work. We didn’t disclose all that stuff in the beginning, of course, for a couple of reasons. We kept our last names and personal lives out of it because of concerns about our privacy. We had heard that Wal-Mart’s critics could be vicious in their attacks. Now we know those concerns were valid. And we kept our professional lives out of it — where we work and what we do for a living — because this was not about the organizations we work for – I did this blog because I thought it would make a great story. Jim did this because we live together. We took vacation time in order to make this trip. We weren’t out there as representatives of our employers, or anybody at all but ourselves. So now we’re being attacked. Why? Because we dared to write positive things about Wal-Mart. The people who hate Wal-Mart couldn’t argue with anything we said — we were writing about real people and telling true stories. Even these personal attacks won’t sour my feelings about Wal-Mart. I’ve met too many great people in Wal-Marts across the county. I’ve met too many people — real people, not imaginary Internet people — who’ve told me about all the good Wal-Mart has done. I’ve camped in Wal-Mart parking lots. I’ve met these people and heard their stories firsthand. Which is something the people who attacked Jim and me haven’t done and don’t care to do. So I’ve made the trip. I had a great time. I loved meeting the people we met, listening to the stories we heard. After everything that’s happened, I even loved blogging about it all. And if I had the chance, I’d do it again. In the end, that’s all that really matters. Well we pulled into Atlanta – tired but satisfied that we had successfully motored 2,843 miles without accident or boredom. It was quite an eye opening adventure for Jim and I. We learned a lot about RVing, like 32-feet is nowhere near as big as it seems. Plus those doorways are the perfect height for a 6'2'' person to bump his head (repeatedly). At the Georgia National Fair we toured a few RVs that helped us identify the one we will be using for our next adventure. Although even Jim, chef that he is, admitted granite countertops are probably not a requirement for our next RV trip. We saw a lot of the country, which amazed us – the phenomenon of Meteor Crater, the mecca for many at Graceland, the heart wrenching 16th Street Church in Birmingham, and the Native American Artistry at the Zuni Pueblo. We learned there is a story in everyone if you take the time to listen – a few we won’t’ soon forget. A conversation with Connie on Old Route 66. A serenade by Sooners Annabelle and Harley in Erick, Oklahoma. A city boy’s take on raising a future farmer by Vic Hill. We want to send a special thank you to all the Wal-Mart associates and customers along the way that took the time to tell us their tales – whatever they may be. Copyright © 2006 Working Families for Wal-Mart. All rights reserved.